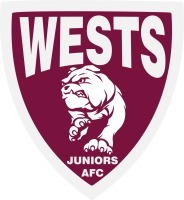 Wests Juniors AFC is a family focused junior AFL club committed to providing a positive and supportive sporting experience for its members. In recent years, Wests has developed a reputation for running one of the best junior, youth and youth girls programs in Brisbane, striking the balance between participation and player development. With the changes in age group structures for youth football in 2017, we are planning to run two teams in each of the under 12, under 14 and under 16 age groups as well as an Under 18 team. We are now seeking applications from interested parties in the youth age groups. Actively work with coaches in other age groups to ensure both development and participation opportunities are maximised for all players within the club. For further information, please contact either Greg Seton-Lonsdale (Director of Football) on 0439 585 868 or Ian Selth (President) on 0404 811 291. Applications should be completed using the application form available at the link below and emailed to our Club Secretary, Stephen Vick, at westsjuniors@aflbj.com no later than Friday October 28th.